If you have been named the administrator or executor of an estate, a friend or family member has left you a great responsibility. As the administrator of an estate, you are required by law to complete a number of specific tasks. Further, the failure to perform these tasks can expose you to personal liability. If you are unfamiliar with these fiduciary duties, the process of probate or administration can be especially daunting. Our firm handles these matters every day. We have years of experience counseling families on estate administration matters in the New York State Surrogate Courts, including probate proceedings and intestate administrations. While the probate or estate administration process does require some time to complete, in many instances, a diligent lawyer can greatly expedite the process. We place a priority on these matters and our experience will help you complete the administration process as quickly and efficiently as possible. If you are looking for answers to your questions about probate or the estate administration process, please call us at 518-392-2555. We can also be reached by e-mail. 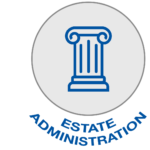 Are you the administrator or executor of an estate? Has a friend or family member left you this responsibility? We counsel families on estate administration in the New York State Surrogate Courts, including probate proceedings and intestate administrations.